I ate popcorn for dinner tonight. The weather has been hot and sticky, making me not in the mood for most food. I did make a chicken recipe for my husband and youngest son, but nothing heavy for me. Every summer it's the same. It takes a couple of weeks after the weather gets warm for my body to adjust to eating normally. Even after I adjust I still eat far less than during the cooler months. I do eat a lot of salad and ice cream, not the greatest food options, but cool and refreshing none the less. The males in my family never seem to be affected by the weather, they eat a ton year round. BBQ is one of their favorite foods, they literally love it in the dead of winter through the summer heat. This week I tried a new recipe for Cajun Slow Cooker Pulled Pork from the June 2013 issue of the Food Network Magazine. This recipe has 12 ingredients. It takes 30 minutes of total time (plus 8 hours in the slow cooker), 20 minutes of which is active and makes 8 servings. I did make a few changes to the original recipe. First, I made my hamburger buns from scratch. I gave up buying hamburger buns a few years back, it is so much cheaper to make them at home. Whenever I make meat in the slow cooker I always brown my meat first. Sear it quickly in a pan on the stove, browning it on all sides in a little bit of olive oil. This step allows the meat to seal in its juices and keep it moist during cooking. Make sure to add the meat fat side up, this will also allow the meat to not become tough. My husband really enjoyed this recipe. He is a big fan of andouille sausage and this recipe does a great job of combining the sausage with the pork shoulder. The flavors blend well together and it is a nice change of pace from traditional BBQ recipes. Best of all it is all done indoors and the clean up work is very simple. For the recipe go to Cajun Slow Cooker Pulled Pork. i love pulled pork! this sounds delish! stopping by and following from walkabout hop. I love pulled pork too, it's great year round! I eat less in the summer, too. Something about the hot, sticky weather that makes eating heavy meal unappealing to me. But here in MA, we only have 3 months of summer, so I'll be back to eating normally soon enough. What a great blog! I'm glad you stopped by today so I could check it out. I eat a lot less in the summer too, and much lighter. It's a great time for fruits and salads. This sandwich looks awesome. We love some BBQ around here too! Thanks for stopping in at Time with A & N. Looks like I could find lots of yummy food ideas here. I also noticed you're raising two young children far from home and family. We should share survival ideas. I grew up in KC and my husband in Erie PA and we live outside Baltimore Maryland.I have two little girls at home so I completely understand the sanity and other emotional issues attached with being so far from home. Stay in touch. It is hard moving far from home. Luckily I have found a great support system here with my husband and his family. I'm lucky that I have two families, one far away and one close to home :) With two girls you must have your hands full just like me! We should definitely stay in touch! Going over to check out your site! Do you have your hamburger bun recipe on the site? I am never happy with any of the processed white flour options in the grocery store and would be willing to try homemade if it's not too much work. They are both good, it just depends on how long of a time commitment you are looking for! I was a vegetarian for a long time :) Thanks for the sweet comment! Love pulled pork sandwiches. Just had some slider versions of this a few nights ago at an event I was at. I am the same. When weather gets hot out I don't want to eat much! Sliders are the best, I love them! Our weather has been in the 90's this week so I have been horrible about eating :) I just can't eat when the weather gets too warm! Oh my... this looks delish. I just love pulled pork sandwiches and am eager to try your recipe. Thanks :) I am a huge fan of pulled pork too! If you try the recipe tell me how it turns out. Sounds like a wonderful Sandwich recipe! It really is a great sandwich and so easy since it's made in the crock pot! Perfect for Summer! This post is being featured at Family Fun Friday. Thanks for the feature, going over to check it out now! 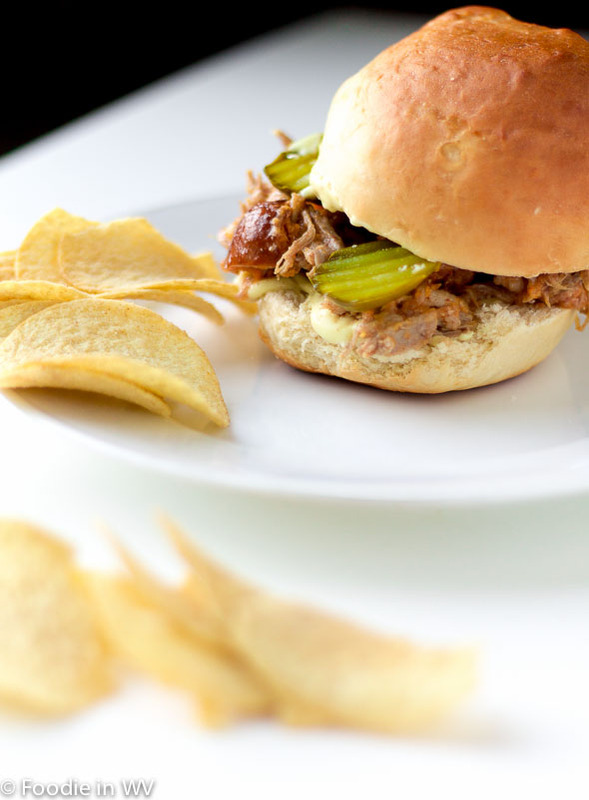 In my book there isn't a sandwich better than BBQ pulled pork!Great recipe! Thanks for sharing on the BBQ Block Party. Can't wait to see what you bring next week. Thanks for hosting :) And I agree about pulled pork, it's delicious! Haha! I had popcorn for supper about three nights ago! Man, I really want a BBQ sandwich, but I am so far from home right now and surrounded by weird BBQ (and I don't have a slow cooker here! Grrr!). Great blog Ann, I would love to see your homemade bun recipe, I just don't have one that is light and fluffy and with hamburger season here I would love to try making them.